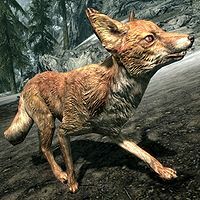 Foxes are small, non-aggressive creatures found in the wilderness of Skyrim, often chasing rabbits. Red foxes will leave pelts behind upon death, which can be used for tanning purposes. When approached, foxes will flee. They will generally only become hostile if they are under the influence of a Spriggan. 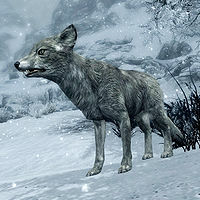 There are three unique foxes, two of which are added by Hearthfire. With the installation of the Hearthfire add-on, either variant can be brought home as pets by adopted children. Both variations of foxes fail to respawn due to missing respawn flags in the game data.